This article is about Olimar's appearance in Super Smash Bros. Brawl. For other uses, see Captain Olimar and Pikmin (species). Olimar (ピクミン＆オリマー, Pikmin & Olimar) is a newcomer and playable character in Super Smash Bros. Brawl. He was confirmed on January 09, 2008 on the Smash Bros. DOJO!! website. Olimar ranks 3rd on the current tier list, putting him in the A+ tier. He has one of the best damage racking abilities in Brawl, with his throws, up aerial, forward aerial, and Pikmin Throw being able to deal damage very quickly, and strong KO power without compensating much speed; all of his smashes and his Pikmin-based aerials are powerful when used with Red, Blue, and especially Purple Pikmin. Olimar's grabs are among the farthest-reaching in the game, and all four of his throws can KO when used with Blue and/or Purple Pikmin. 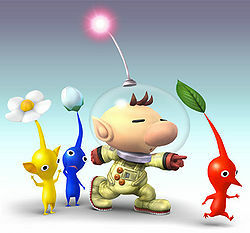 Olimar also possesses a strong camping game and can use his long-ranged Pikmin attacks to create a wall that is very difficult for characters such as Donkey Kong to get through; the various types of Pikmin Olimar can use also makes him relatively unpredictable, with the type advantages of each Pikmin allowing for some advantages in some matchups. Olimar's biggest weakness, however, is his terrible recovery (one of the worst recoveries in the game) that is easily edgehogged and provides terrible distance if he does not have many Pikmin with him, as well as relatively poor approach options, due to his limited air and ground speeds, and susceptibility to juggles, pressure, and edgeguarding (which combines with his terrible recovery to give him very poor survivability). These disadvantages put him at even matchups against the likes of many characters who can approach in the air effectively, such as Peach and Ness. However, Olimar has very strong matchups against most characters (possessing only three disadvantageous ones), and has achieved very strong tournament results. Olimar is a unique character. All but six of his attacks rely on Pikmin to perform, each with unique characteristics and suitability to each type of move. As such, it is difficult to quantify the effectiveness of any particular class of Olimar's moves. In general, the Pikmin can do severe damage if not dealt with, they can block certain moves to halt approaches or recoveries (like Ike's Quick Draw and Ness' PK Thunder), they can allow some of Olimar's attacks to continue even if he is hit, and they can combine to become a long tether. In addition, if Pikmin are ordered correctly, Olimar can have powerful throws (using Blue Pikmin), the longest grab range in the game (White or Blue), great aerials (Red, Yellow, and Purple), extremely damaging and powerful smash attacks (Purple), and a highly-damaging projectile in Pikmin Throw (White). Olimar generally has quick, long-lasting attacks, including his useful down aerial meteor smash, and he is one of the smallest characters in the game, a factor that when combined with his Pikmin Order's armor makes KO'ing Olimar no small task. He can also be very difficult to approach if wielding many Pikmin. Finally, Olimar's primary three Pikmin (Red, Yellow and Blue) are each immune to certain types of attacks (flame, electricity, and water respectively), making them more difficult to deal with in certain matchups. At his purest, Olimar is about damage. Aside from Purples, all his Pikmin can be continuously thrown at the opponent until they are up close, constantly racking up the damage, while Olimar has two Pikmin-less moves capable of sucking in the opponent for more damage in his up-tilt and neutral-air. Pikmin Throw can be the most damaging projectile in the game should the opponent be indifferent or occupied (one White Pikmin can do up to 36% damage when the target starts with low percent and does not knock it off). Also note that Olimar's forward smash, side special, and grab all look similar, making it difficult to tell what he is doing. He can continuously guard himself with long-lasting/reaching moves for the opponent to run into, in their hurry to stop having Pikmin assault them. Olimar is arguably the best shield-grabber in the game, with his grab range being fantastic on all Pikmin except Purples; the range is good enough to make up for the slight lag of the grab as opponents are occasionally too far away to take advantage of the grab attempt (unless they've sidestepped). Olimar is excellent at popping the opponent into the air for aerial damage with his fast, deceptively-ranged (in front) up-smash, best performed with a Yellow Pikmin for max range. From there, he has a long-lasting up-air which serves as both a superb defence above him, as well as an excellent way to harass opponents returning to the ground, and it cancels quick enough to throw up another up-air, an up-smash, or a Pikmin Chain should they be more to the front of Olimar. Like Falco, even good players can count on a good Olimar taking the first 50% or so of a stock without a problem, especially if down tilt, Olimar's best setup move regardless of percent, hits. Olimar's not bad at KOs, either. Rarely can an opponent facing an Olimar predict which Pikmin is coming next, or how, so surprise Purple smashes or Red aerials can cause serious problems. Forward smash in particular is deadly, due to its range, power (especially with a Purple), and how difficult it is to punish, while a Purple up smash can KO in the 80%'s if fresh (while players would prefer to use the up smash early and often for spacing purposes, they will attempt to save it for surprise KOs in doubles). Blue Pikmin horizontal throws, along with Purple Pikmin vertical throws, are also cause for concern due to their KO'ing ability. Though he has significant strengths, he does have his drawbacks. If Olimar has no Pikmin in his lineup, none of his smashes, directional aerials, grabs, or damaging special moves have any effect, rendering the majority of his moveset unusable until he obtains Pikmin. This problem is heightened as Olimar loses all his Pikmin when he is KO'd, making him predictable for the first few seconds of every stock (save for the first) because most Olimar players will most likely use their invincibility frames for plucking Pikmin instead of attacking. All Pikmin (excluding Blue ones) drown in water deep enough to cover their whole body, which can make him vulnerable when fighting on stages such as Jungle Japes and Summit. As Olimar does not perform grabs himself, he does not gain armor from them (only the grabbing Pikmin does) and so he cannot grab through opponents' attacks, unlike all other characters. He is also a very light and floaty character; his floatiness makes him easy for most characters to juggle, especially since his aerials have unusual priority rules that hamper his ability to counter other aerials, and his neutral air (his only non-Pikmin air attack) is not designed for defense. His mobility is also slow, both in the air and on the ground. Olimar players must also learn what each Pikmin are capable of and must adapt to each one, especially in the middle of a fight - a careless or inattentive Olimar player may miss a sure KO if a Purple smash or grab is out of range or a White Pikmin is used to attack by mistake. Combined with needing to pay attention to Pikmin that do unexpected things due to randomness or glitches, this gives him an extremely high learning curve. Olimar's biggest problem is his abysmal recovery. Although his double jump is decent, he has poor air speed and relies on a tether recovery. As a result, he is at the mercy of edge hogging, and because the move puts him into the helpless state he must attempt to throw Pikmin to fend off an opponent trying to do so before he attempts to grab the edge - and since the length of his tether is based on how many Pikmin are in his line, this can make the problem worse by hurting how far away he can grab the edge from. It also means that, should the opponent manage to get Olimar down a few Pikmin, he will have much fewer options when put off the stage and have a good chance at being gimped (despite his slightly wider meteor cancel window). Olimar is also on the low end of the weight scale, which reduces the time needed for his recovery weakness to assert itself. On the whole, Olimar is a highly technical character whose extreme learning curve is rewarded with a very strong moveset and unpredictability. New players will struggle with his unusual mechanics, but those with astute Pikmin micromanagement can turn Olimar into a veritable powerhouse. 9 Red Pikmin are the basic offensive Pikmin. They deal the most damage for all regular attacks with the second-highest knockback. Reds are also immune to damage caused by flame hitboxes; they will simply eat the attack and continue their current action - since many characters can use fire, this makes them valuable as pseudo-outprioritizers for many matchups and allows Olimar to toss them straight through flammable enemy projectiles. Red Pikmin themselves deal fire damage for most of their attacks. Their biggest downside is their weakness to water; they die almost immediately upon landing in swimmable water, unlike other Pikmin. Red Pikmin are more likely to appear from cloth and sand floors, while they are less likely to appear from snow and ice (and cannot be plucked from shallow water at all). 9 Yellow Pikmin deal average damage, with their main asset being their range - all Yellow hitboxes are bigger than their non-Yellow counterparts. Yellow Pikmin are also immune to electric attacks, allowing them to safely block a PK Thunder or Charge Shot, and produce electricity upon contact with other opponents during an attack (complete with more freeze frames). Combined with their increased hitbox size, this makes them easier to space with. When thrown, Yellow Pikmin will travel slower than other Pikmin and move in a pronounced arc. Depending on the terrain, this can make it easier or harder to connect with. Yellow Pikmin have no particular disadvantages, making them a useful type of Pikmin. They are more likely to appear from metallic or sandy floors, while they are less likely to appear from snow and ice. 14 Blue Pikmin have more health than other Pikmin (second to Purple Pikmin), while most of their attacks deal slightly below-average damage. On the other hand, they have the longest grab range, and their throws deal very high knockback, KO'ing at medium percentages. Blue Pikmin are immune to water-effect attacks as well as drowning; any non-Blue Pikmin will drown if left swimming for more than one second. As a result, knocking Olimar into the water of stages such as Delfino Plaza or Pirate Ship will effectively delete all non-Blues from his lineup and make his attacks a bit more predictable for a while. Blue Pikmin are more likely to appear from water-based surfaces (snow, ice, clouds, water itself), while they are less likely to appear from sandy or brick floors. 4 White Pikmin have very low health (the lowest of all Pikmin) and deal minimal damage for most attacks; connecting with a White smash or aerial produces a feeble noise and knockback that generally can't KO below 200%. On the other hand, when used to pummel or when thrown, they deal a lot of darkness damage, significantly more than any other Pikmin. When thrown, White Pikmin travel very fast and very far, making them easy to toss off the edge unexpectedly but often easier to hit opponents with. They also have slightly higher movement speed than other Pikmin, so they do not fall out of Olimar's lineup as often. White Pikmin typically appear half as often as the basic three, although they are more common when pulled from snow or clouds. 15 Purple Pikmin are the rarest Pikmin, appearing 0.4 times as often as the basic three on most terrains. They are also very slow; they sometimes lag behind Olimar and fall out of his lineup, and they don't travel very far when thrown, sent for a grab, or used in a smash attack. On the upside, they provide highly damaging attacks (second to Red Pikmin, and only for some attacks), have the most health of all Pikmin, have very good up and down throws, and deal the most knockback. Purple Pikmin do not latch onto opponents when thrown, they simply ram into them and deal damage; this mixup can halt opponents attempting to run through Pikmin Throw unhindered. Purple Pikmin are more likely to appear from metal, brick, or grate floors and are generally seen as the most useful Pikmin by the community. All of Olimar's Pikmin-based moves and grabs use the next Pikmin in the line to perform the given attack, and the knockback and damage are dependent on the Pikmin type. That Pikmin then goes to the back of the line. 3%, 2% (antenna) — — — — — Olimar headbutts twice, first one having set knockback, the second dealing knockback to keep opponents away. Worth noting it actually hits four times, with the antenna on Olimar's head dealing slight damage but no knockback or hitstun. 6% — — — — — Olimar kicks both legs forward, falling to the ground. Has decent knockback at higher percentages. 1% (hits 1-7), 4% (hit 8) — — — — — Olimar jumps a little and spins in place, hitting multiple times. The last hit deals significant knockback. 6% (body), 2% (antenna) — — — — — Olimar does a headbutt along the ground and gains slight distance. Deals minimal knockback, which can combos well into up-tilt/smash early on, and is an excellent setup move at higher percentages. 7% (hit 1), 4% (hit 2) — — — — — Olimar does a cartwheel forward. Has vertical knockback. — 15% (clean), 12% (mid), 9% (late) 13% (clean), 9% (mid), 6% (late) 15% (clean), 11% (mid), 6% (late) 9% (clean), 6% (mid), 3% (late) 18% (clean), 16% (mid), 13% (late) A Pikmin leaps forwards with a spinning bodyslam. — 15% (clean near), 14% (clean far), 12% (late) 14% (clean near), 12% (clean far), 10% (late) 15% (clean near), 13% (clean far), 11% (late) 9% (clean near), 7% (clean far), 5% (late) 16% (clean near), 13% (clean far), 13% (late) A Pikmin rockets upwards. — 13% (clean), 10% (late) 11% (clean), 8% (late) 12% (clean), 9% (late) 6% (clean), 4% (late) 15% (clean), 12% (late) Two Pikmin dashes out to either side. 2% (hits 1-6) — — — — — Olimar spins around, similar to his up tilt. — 15% 12% 13% 5% 14% Olimar swings a Pikmin forwards. — 13% (head), 11% (body) 12% (head), 9% (body) 13% (head), 10% (body) 5% (head), 4% (body) 13% (head), 10% (body) Olimar swings a Pikmin behind himself. — 3% (hits 1-6), 6% (hit 7) 2% (hits 1-6), 4% (hit 7) 3% (hits 1-6), 4% (hit 7) 1% (hits 1-6), 3% (hit 7) 3% (hits 1-6), 4% (hit 7) Olimar lifts a Pikmin upwards, with the Pikmin dealing multiple hits. — 16% (clean), 7% (late) 12% (clean), 6% (late) 14% (clean), 6% (late) 8% (clean), 4% (late) 14% (clean), 6% (late) Olimar smacks a Pikmin downwards. Sweetspot meteor smashes opponents in the air. — — — — — — Olimar sends a Pikmin forth to grab opponent. Except for purple Pikmin, it is one of the farthest reaching grabs in the game, and is the farthest reaching with white and blue Pikmin, with pivot grab being particularly notorious. — 2% 2% 2% 4% 2% Pikmin headbutts opponent. — 6% 7% 13% 6% 7% The Pikmin releases the foe forwards. One of the strongest forward throws in the game in terms of knockback. — 7% 9% 14% 7% 9% The Pikmin swings the foe backwards by slamming them onto the ground. One of the strongest back throws in the game when it's a Blue Pikmin. — 9% 11% 12% 6% 11% The Pikmin leaps into the air, turns the opponent upside-down, then slams the opponent into the ground. It is by far the strongest up throw and the second strongest throw in the game. — 1% (hit 1), 8% (throw) 1% (hit 1), 7% (throw) 1% (hit 1), 11% (throw) 1% (hit 1), 5% (throw) 1% (hit 1), 7% (throw) The Pikmin slams opponent on ground, then jumps quite high, to jump on top of opponent. Can be used to chaingrab fastfallers and heavyweights (best done with Blue Pikmin). 6% — — — — — Gets up and headbutts both sides. 6% — — — — — Gets up and punches both sides. 5% — — — — — Gets up and headbutts forward, then kicks backwards. 8% — — — — — Quickly gets up and headbutts onto the stage. 10% — — — — — Slowly gets up and sticks his foot out. Pikmin Pluck — — — — — — Olimar quickly pulls out a random Pikmin out of the ground. What type of terrain where this move is used has some influence on what type of Pikmin will be pulled out more often. Olimar can have up to six Pikmin following him, trying to pluck another, will result in Olimar grabbing nothing and being vulnerable for a moment. Pikmin Throw — 9% (thrown), 2% (latched) 7% (thrown), 2% (latched) 7% (thrown), 2% (latched) 6% (thrown), 6% (latched) 6% Olimar throws a Pikmin at an enemy, then the Pikmin latches onto the enemy and slowly racks up damage. If the target cannot be latched onto, or the Pikmin is Purple, it simply deals damage. Pikmin Chain — 7% 6% 6% 6% 8% Olimar creates a chain of Pikmin and uses it to latch onto a ledge, functioning as a tether recovery. The less Pikmin Olimar has, the less reach this move has. However, Olimar will rise up slightly to counteract this. Pikmin Order — — — — — — Olimar quickly blows his whistle, and a colored area surrounding him. Any Pikmin that are separated from Olimar will immediately fly to his side after a split second . This can be used to recall ones that have fallen behind or are pummeling an enemy, though Pikmin in the midst of some actions (such as travelling after being thrown) cannot be recalled. This move gives Olimar armor. End of Day 10% (bury), 15% (ascent), 43% (Bulborbs), 10% (descent), 15%/20% (landing) — — — — — Olimar takes off in his spaceship, leaving his opponents alone for Red Bulborbs to attack them. Afterwards, the ship crash lands back onto the stage, hurting anyone in its path. Exits the Hocotate Ship and plucks three Pikmin from the ground. Up taunt: Jumps joyfully as if he had gained a new part for the Dolphin. Similar to the Ice Climbers' up taunt. Side taunt: Lays down on the ground as if he were asleep, then rolls over and gets up. Similar to Pikachu's down taunt. Down taunt: Swings his hips. Moves his arms further and back in a basic limber-up exercise. Rubs his helmet with both hands. Olimar plucks a Pikmin, the Pikmin cheers, and Olimar blows his whistle. A small excerpt of the title theme from Pikmin. Moves his head left and right while three Pikmin run around him in a circle. Olimar plucks various Pikmin, and each jumps on him before hitting the ground, until a Purple Pikmin lands on top of him, knocking him over. Moves his hands up and down while facing a red Pikmin and a yellow Pikmin. Olimar has a very favorable matchup spread against the majority of Brawl's roster, because he has many distinct advantages over most of the cast. According to the Smashboards Matchup Chart, he has the second highest unweighted total and the third highest weighted total. He is soft countered by three characters, has seven even matchups, soft counters ten characters, counters nine characters, hard counters five characters and has two close to unloseable matchups. Olimar's damage racking game with his Pikmin is formidable, as is his ability to control the stage. His strong camping abilities work well against high-ranking Pikachu, King Dedede and Snake, who are primarily ground based characters. However, characters who have good stage control or excel in the air, such as Ice Climbers, Meta Knight, or Falco, counter Olimar. Brood - a top Japanese Olimar player, placing 2nd at Apex 2010. Dabuz - Olimar main from New York, considered one of the best Olimar players in the U.S. along with Rich Brown when he was active. Denti - Olimar main from Texas, known for placing 3rd at SKTAR 2 and 2nd at WHOBO 5. Logic - a top Olimar player from Maryland/Virginia. Nietono - a top Olimar player from Japan, known for placing 2nd at Apex 2012. Oiwa - Japanese Olimar main, placed 5th at Sumabato X Final. Rich Brown - a SoCal Olimar main, considered the best in the United States along with Dabuz during his prime. Tin Man - a top Canadian Olimar main, who later moved to Australia. Shortly after Brawl's release, Olimar was ranked 18th place just one place above the middle, with many players writing him off as another mediocre, gimmicky character who would never make an impact in serious play. This could probably be because many overemphasized Olimar's reliance on Pikmin, stating that it was a hindrance (rather than a boon, as it is often seen today), and failed to get past his relatively high technical and cerebral learning curves. However, as many players began to realize Olimar's strong damage-racking capabilities, camping ability, and disproportionately high KO power for and even beyond his weight class, Olimar's metagame developed further, causing a rise to 10th-11th in high tier by the next tier list. Olimar would maintain similar placings for several years, but as his professionals such as Rich Brown, Brood, Nietono, and Dabuz began doing very well at high-level tournaments such as MLG DC 2010, Apex 2010, and Apex 2012, Olimar skyrocketed to 2nd place right underneath Meta Knight in April 2012. Olimar is currently ranked 3rd on the tier list, after Meta Knight and the Ice Climbers, and is one of the most disliked Brawl characters casual and competitive players alike, having a reputation for being one of the most frustrating characters to deal with due to his powerful camping ability and range, which many smashers find extremely hard to break through. As a result, many Olimar players such as Denti and Logic are among the most disliked players in the community when it comes to playing style. Captain Olimar's Pikmin are assaulting a large R.O.B., but are unable to deal damage and perish when the R.O.B. spins. Captain Olimar begins to shiver in fear, but a Red Pikmin alerts Olimar to the Blue Falcon speeding their way. Captain Falcon jumps out of the Blue Falcon and then Falcon Punches the R.O.B., causing it to fall backwards in a disabled state. Captain Falcon then slides on the ground to land, killing all the remaining Pikmin bar the Red Pikmin. A leaf blows by as Captain Falcon remains there, striking a pose. The two captains then team up to take on the Subspace Army. Upon reaching the edge of the Isle of Ancients, they witness Diddy Kong attacking some Primids and rescuing Donkey Kong. Captain Falcon and a reluctant Olimar then decide to join forces with the Kongs, and upon reaching them, the Primids return with backup. Donkey Kong, Diddy Kong, Captain Falcon, and Olimar manage to fight them off before they see off Falco Lombardi, who had helped Diddy in bringing him to the large Cargo that DK was held on. Olimar and his Hocotate Ship Outside the Ancient Ruins. The Cargo takes Olimar and his crew inside the Subspace Bomb Factory, and they begin to move through it. They eventually find the Ancient Minister, along with Pikachu and Samus. A hologram of Ganondorf suddenly appears and commands the R.O.B.s in the room to detonate the Subspace Bombs in the room so he could create a large enough hole in space to fit a Subspace Gunship through. The Ancient Minister reveals himself to be the leader of the R.O.B.s and helps the other heroes defeat the Subspace underlings that Ganondorf sent out. Olimar, along with R.O.B. and the rest, escapes from the island before it is sucked into Subspace (defeating Meta Ridley in the process). All of the heroes then unite to take down the Subspace Gunship and enter Subspace. Olimar contributes by putting his ship, the Hocotate Ship, at the heroes disposal. His excellent piloting allows him to avoid the huge ship's turrets until Kirby destroys it. Unfortunately, Olimar and the others were doomed to be turned into trophies by Tabuu. However, hope comes in the form of King Dedede, who created some badges that revive trophies into the original fighter. Olimar and others are rescued by Dedede and his team consisting of Luigi, Ness (and Kirby). With everyone revived, they are able to take down Tabuu and save the world. Olimar can perform a glitch with Pikmin Throw in the Great Maze. In the Halberd stage with the elevator, if one throws Pikmin down the hole after one destroys the blocks, they will be stuck in spinning mode and eventually die unless one hits the other bomb blocks. In SSE, in the first cutscene with Olimar there are no White Pikmin on the Giant R.O.B. In fact, only two White Pikmin appear in the entire SSE. Event 14: Sproutrage of the Flower Pikmin: Olimar must protect 6 Pikmin from Pikachu and the Pokémon Trainer until they all bloom into flowers. Event 20: All-Star Battle x1: Olimar is one of the eight opponents fought in this event along with Wario, Meta Knight, Pit, Zero Suit Samus, Lucas, Diddy Kong, and the Pokémon Trainer. Event 26: The Slow and Easy Life: Ness must defeat 3 tiny Olimars on Smashville before K.K. Slider's song ends. Event 28: Flower Blooms in the Echoes: Peach has to hit all the leaves on the largest tree on the right red on Hanenbow while avoiding Olimar, who will try and interfere with Peach's efforts to do so. Co-Op Event 12: Come Back! Falcon Flyer: Captain Falcon and Olimar must defeat two Samuses in under 30 seconds. Olimar's main and Final Smash trophies can be obtained by clearing Classic Mode and All-Star mode respectively with Olimar. Veteran spacefarers in the employ of Hocotate Freight. After crash-landing on an enigmatic planet, Olimar met the mysterious beings known as Pikmin. He enlisted their aid to find his spaceship parts and help him escape. Once home, he found his employer on the verge of bankruptcy. He was sent back to the Pikmin world with his partner, Louie, to repay the company debt. Olimar's Final Smash. Dusk falls, and his spaceship makes a landing. Olimar takes the Onion, with all his Pikmin aboard, and blasts off for the stars. In Pikmin, native life-forms grew active and violent at night, making it lethal to remain on the surface—this is why Olimar would take his Onions and leave at night. This technique breaks the framework of the game. In the Home-Run Contest, Olimar will only pluck Purple Pikmin. As soon as Olimar's tether latches onto a ledge, Olimar will hold his arms out in a T-pose, the position used by game producers while designing characters. If Olimar gets hit, his eyes pop out (a reference to Pikmin 2). When giant or tiny, Pikmin's voices do not change pitch while being thrown or when they die, although they do change when Olimar plucks them. Olimar, Samus, R.O.B., and Mr. Game and Watch are the only characters that do not talk or make vocal noises in Brawl. Additionally, in the first three games, Olimar is the only character to not have a voice clip when Star KO'd. When Olimar loses in a Stamina match, his Pikmin do not die, but instead stand around Olimar. Olimar is tied with Sonic for highest increase in a tier list (Olimar rose to 10th from 18th from the 1st Tier List to the 2nd). Olimar is the only playable character in Brawl that there is not a sticker of. If Pikmin are away from Olimar for too long, they will start blinking and after a few seconds, automatically die, which is a reference to the Pikmin series; when Olimar leaves the planet for night, any Pikmin will die if left behind. Olimar, Diddy Kong, Captain Falcon, King Dedede and Ike are the only characters to use their Final Smash in the Subspace Emissary; Olimar uses his ship to fly into Subspace. In the SSE, Olimar's Pikmin count is reset to 3 every time he spawns (either through someone else's fall or walking through a door). Pikmin & Olimar's page at the Smash Bros. DOJO!! This page was last edited on April 20, 2019, at 18:57.